According to the World Population Ageing 1950-2050 report , issued by the United Nations, population ageing is a global phenomena affecting every country. The proportion of people aged 60+ is steadily increasing, and without any changes, their number will exceed the number of young persons. In the more developed countries, the percentage of ageing adults in the society might raise from 20% in 2000 to 33% by 2050. This demographic shift would have an important effect not only on the socio-economical processes, but also cause structural and functional consequences for the human visual system. The study by IPSOS (2011)  showed that the major visual problems, reported by 60% of patients aged 60 years and more, are related to light conditions. Difficulties with reading under a dim light, elevated sensitivity to bright light sources and decreased vision at night are the most common visual symptoms mentioned by respondents. The other difficulties stressed by elderly patients were: reading small print (e.g. medical instructions), lower contrast while looking at colored backgrounds and irritability to sunlight. Around 17% of those who responded also indicated disability glare as real hindrance in their daily life. It might be related to increase of intraocular straylight with age, as a result of the natural senile process of the eye. However, those symptoms might become more common, affecting around 75% of patients, and severe once cataract develop. To restore normal vision a cataract surgery is performed, but it has been shown, that in some cases surgery only alleviates the mentioned symptoms. It was presented in the study by Labuz et al. that glare and excessive light sensitivity might bother patients after the crystalline lens replacement (Figure 1). Although, the reason of the straylight elevation in some patients after cataract surgery is still not clear. Therefore, the aim of the project “Intraocular scattering through different optical designs” is to determine sources of increased prevalence of glare and other visual disabilities in patients after cataract surgery. Figure 1. 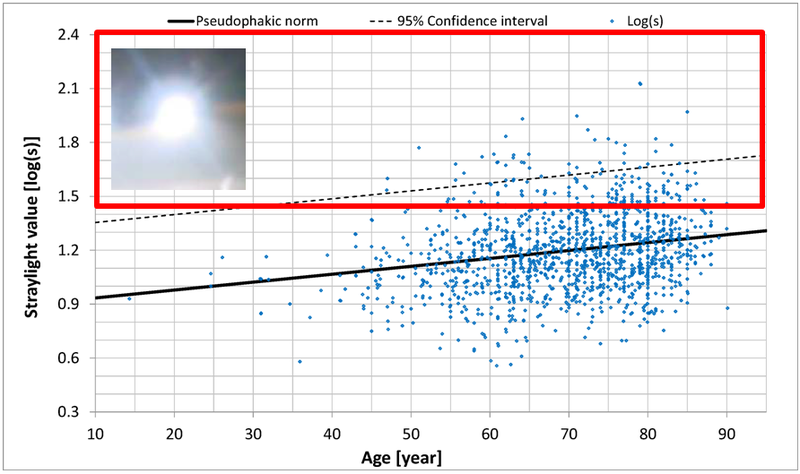 Intraocular straylight as a function of age. The red rectangle indicates elevated level of straylight (disability glare) in normal pseudophakic eyes . The United Nations. Department of Economic and Social Affairs Population Division. World Population Ageing 1950-2050. New York, the USA, 2001. IPSOS Public Affairs, Observatoire de la Maturité, 2011. G. Łabuz, N.J. Reus, T.J.T.P van den Berg. Ocular straylight in the normal pseudophakic eye. J Cataract Refract Surg (in press).